It is strange how a single occurrence in life can change the direction of our future. The following is the way it happened to Louie. 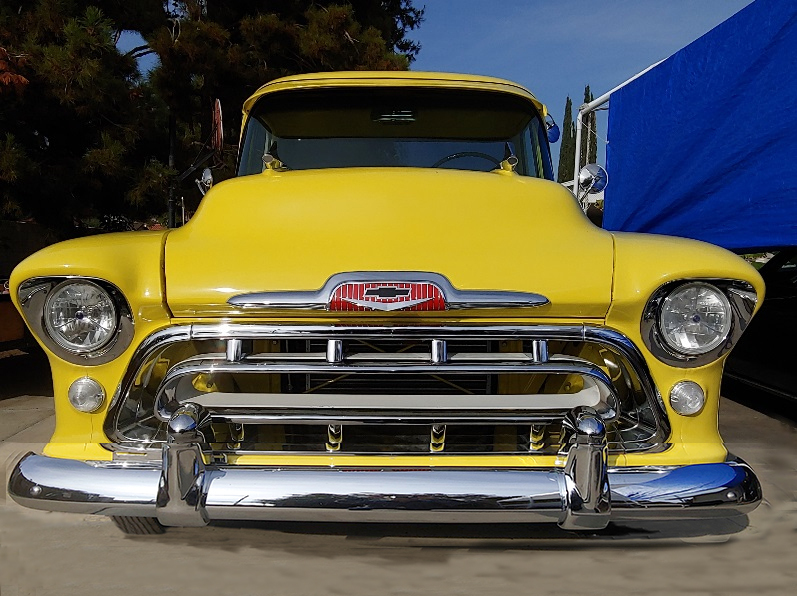 While doing a major rebuild on his Nomad Station Wagon, he needed a truck to haul body parts and mechanical items to shops such as: front fenders, hood, the seats, engine, transmission, etc. 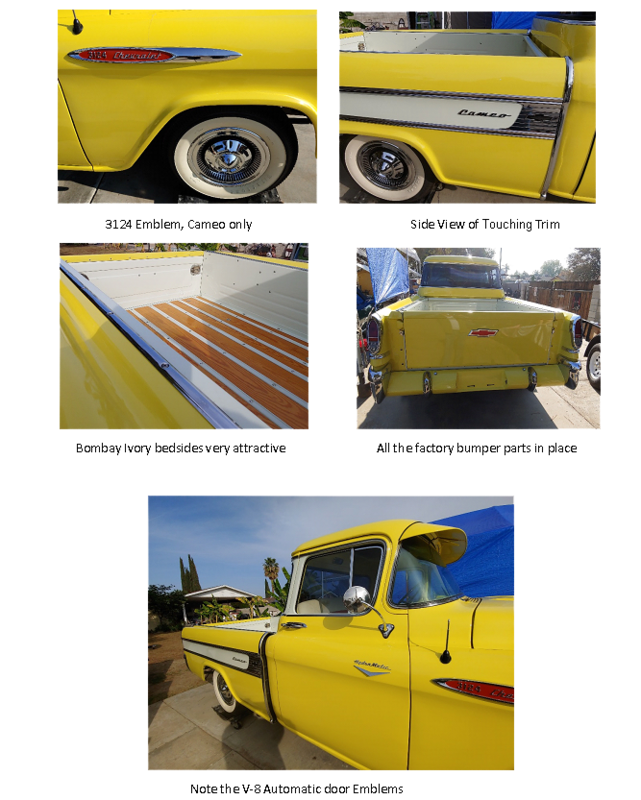 When he saw an interesting classified ad in a local newspaper: “1957 Chevrolet ½ ton pickup for sale, runs good” he wanted to check it out. The first time he saw it, he thought “the bed has a weird appearance.” Louie figured it must be a one of a kind special built for some street rod show! The seller appeared to have no knowledge of its rarity, he bought it for its unique appearance and hauling ability. Now he just wanted to sell it. Louie did some research and said. “Oh my gosh, this is pure Chevrolet.” He had to have it! Plus at the same time he also had a hauler for his Nomad parts. Even before the Nomad was completed Louie began to watch for spare emergency parts, not only for the station wagon project but certainly for his new 1957 Cameo. The more he read about these special trucks the more he realized he found a diamond in the rough. Louie bought it in 1980 but it was not until about eight years later that he made plans to when the ground- up restoration would begin. He had never restored a truck, much less a Cameo, and he was excited! His 1957 Cameo had received no major alterations. It was all pure Chevrolet, so he could make it very close to factory correct without major research. In the meantime, he had a full time job, a Nomad to finish and three small children to raise. It was not until several years before his retirement that he could get serious on the Cameo project. It was taken down to the bare frame and all his experience from prior Mid-1950 Chevy cars went into make this Cameo close to the best. Mechanically, it came with a 283 V-8 and the optional three speed overdrive. Rather, than go through the tired 283 engine, it now has a visually identical 327 engine and a 700 R4 overdrive automatic transmission. Note the special shift lever from the floor. This is a recent addition that makes the automatic transmission look somewhat like a floor shift unit that would have been in a truck. This really adds to the interior appearance. The original 3.90 ratio differential and brakes are still in place. 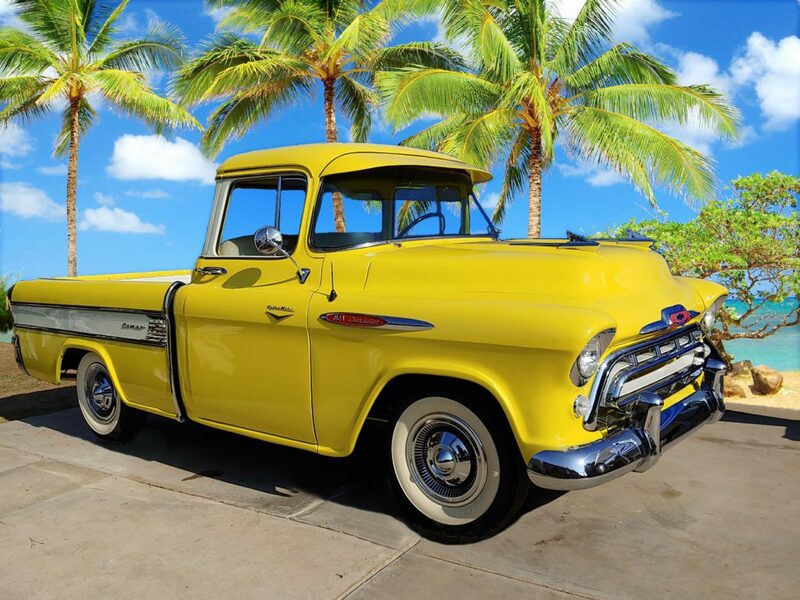 Louie really liked the original Golden Yellow and he was happy to keep it the same. Great choice! 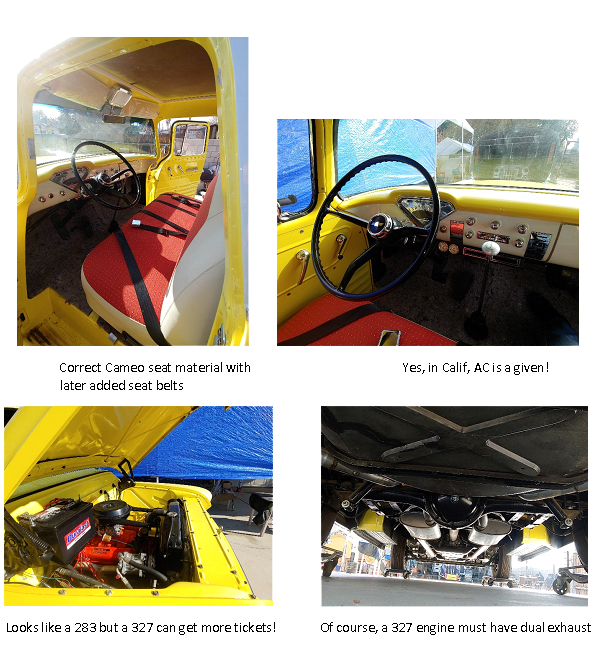 The only color change was to remove the Jet Black inner bed panels and paint in these panels and horizontal outside bed side panels Bombay Ivory (as most other Cameos were that year.) The interior is slightly on the custom side but has been done in good taste. The combination is a real eye catcher. The seat upholstery is of the exact Cameo design used in 1957. We noticed he kept the optional AM radio just like Chevrolet sold the Cameo. NONE! A radio was a factory option. The blank-out has been chrome plated as in the ash tray. Nice touch! He kept the two paint colors on the metal interior just like the factory made it. A few other dealer installed GM options are the metal outside sun visor and the finger-nail scratch guards behind the door handles, and the pair of chrome hood ornaments. V-8 Hood Emblem Just Right! This entry was posted on Monday, December 3rd, 2018 at 1:16 pm	and is filed under Featured Trucks [unsorted]. You can follow any responses to this entry through the RSS 2.0 feed. Both comments and pings are currently closed. Copyright ©2017 Jim Carter Truck Parts Company. All Rights Reserved.